Pull Homme classique Elegant Col V maille fineCol V Bordures côtelées Coupe ..
Hoodie Sweat Capuche Homme Zipper Esprit Tatouage Rider Rock Sweat à capuche forme g.. Pull Sweat Homme classique Elegant Col rond Maille Confort Hiver GrisPullover Sweat pour Homme c.. Pull Sweat Homme classique Elegant Col rond Maille Confort Hiver BeigePullover Sweat pour Homme .. 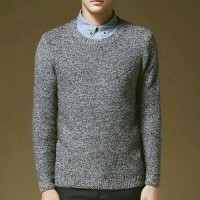 Pull Homme Fashion Col rond Fitted Hiver Noel GrisPull fashion Homme façon tricot ancien, élegan.. Pull Homme Fashion Col rond Fitted Hiver Noel MarinePull fashion Homme façon tricot ancien, éleg..